Cinema Europa is Zagreb’s cult cinema. It was built in 1924/25 by the wealthy Müller family from Zagreb and designed by architect Srećko Florschütz with the aim of constructing the most beautiful, important and modern cinema in the region. Cinema Europa was officially opened on 8 April 1925 with Fritz Lang’s Die Niebelungen and the local film Dalmatia, Land of Sun. The City of Zagreb acquired it in October 2007 after a successful action by Zagreb Film Festival and Croatian Film Association 'Daj mi kino' (Give Me the Cinema). The Croatian film and cultural public and all film aficionados appealed to the city government to acquire this theatre and allocate it for use to cinematic purposes. Early in 2008, Cinema Europa management was trusted to Zagreb Film Festival, with the goal of making this cinema the regional centre of film and film art. In 2013 the Ministry of Culture reached a decision to make Cinema Europa a protected cultural heritage site and Republic of Croatia national treasure. The cinema’s interior and its lavish stucco decorations and post-Art Nouveau classicist details are considered one of the city’s most beautiful spaces. Cinema Europa’s programs are co-funded by the Zagreb City Office for Education, Culture and Sport, Croatian Audiovisual Centre and Europa Cinemas network. Since in January 2008 Zagreb Film Festival Art Association took over Cinema Europa’s management, in terms of program this cinema became the leading regional film institution screening independent contemporary film and the home to almost all of Zagreb’s festivals and events. Every year it regularly screens around 80 independent contemporary films from all four corners of the world and of all genres – feature, short narrative, animated, documentary and experimental. Almost 20 Croatian film festivals and events found a home in Varšavska 3. Annually there are around 30 film premieres of all genres, with a special focus on children and quality titles for pre-school and schoolchildren and lately more and more for high schoolers as well. In addition to film programs, the theatres and lobbies serve as a venue for countless lectures, roundtables, discussions, book and film project promotions, performances, exhibitions, music performances and similar events. Cinema Europa is the winner of the Best Programming Award in 2016, given by Europa Cinemas, a network of European cinemas. The most popular independent cinema in Zagreb garnered the award of the best European cinema with the finest offer in competition with 1078 cinemas from 644 cities and 41 European countries – the current network members. The Best Programming Award is the most important annual honour given by Europa Cinemas, the highest to grant on the European level and one of the most significant honours bestowed ever to a cultural institution in Croatia. Our film programs devote special attention to designing and producing programs for children. These activities were in 2014 encompassed in the program Bib for Kids Cinema, aiming to offer new interactive film content in Zagreb for our youngest audience. Wishing to present as vast a selection of films from all over the world as possible, we have launched our own film distribution and so far presented almost 50 valuable film works. Our partner cinemas present the same films to audiences in other Croatian cities. In association with different cultural institutions we are maintaining the existing and creating new partnerships with the joint aim of creating harmonised programs and a richer cultural offer catering to most diverse audiences (Zagreb Philharmonic Orchestra, Subversive Festival, Third Age University, Museum of Contemporary Art, publishers etc.). Thanks to these partnerships, Cinema Europa hosted lectures and speeches by numerous leading artists and thinkers of today, including Gilbert & George, Amos Oz, Oliver Stone, Jorge Bucay, Slavoj Žižek, Tariq Ali, maestro Ivo Lipanović, David Lynch (via video connection), Samir Amin, Terry Eagleton, David Harvey, Rastko Močnik, Dušan Makavejev, Antonio Negri, Zygmunt Bauman, Michael Hardt, Abel Ferrara, Béla Tarr etc. Cinema Europa’s work and programs are supported by City of Zagreb, Croatian Audiovisual Centre and Europa Cinemas. Digitalization and acquisition of new technical equipment was financed by Ministry of Culture, European Union’s MEDIA sub-programme and City of Zagreb. Cinema Europa is a long-standing member of the largest European network of cinemas - Europa Cinemas, and the global network of independent cinemas CICAE. Since 2014 the cinema is also a member of the Croatian Independent Cinemas Network. Cinema Europa’s building was constructed in 1924/25 and designed by architect Srećko Florschütz (studio S. Florschütz and Hintermeier brothers), as an essential part to a larger urban ensemble: the commercial-residential four-storey street building in Masarykova 10, the city passage with a commercial-residential four-storey gallery building in Miškecov prolaz 1-3, and the opposing cinema-theatre building and the commercial-residential four-storey building in Varšavska 3-5. The cinema-theatre building was constructed as the representative Cinema Balkan-Palace by brothers Alfred and Leo Müller, heirs to the largest brickyard in the city, Müller in Kustošija, and the founders of the prominent Fruit Industry Miler’s Hill. Leo Müller (Zagreb, 1894 – Jasenovac, 1941), a film devotee, tried his hand as an actor in first Croatian films, after constructing the Helios cinema in 1916/17 in Frankopanska 10/1 (today’s Gavella Drama Theatre), in 1924/25 builds an elite cinema in Varšavska, at the location of the famous restaurant Lobe-Krizmanić, with a pub and a dancing room, stood since the late 19th century. Its basement segments (freezer and cooling chambers) were preserved in the northern part of the cinema-theatre, renovated in 1919 for the first Balkan cinema building by the Müller brothers and designed by architect Ferdo Šego. The first Croatian cinema theatre was constructed on an iron structure, 56 metres in length and 15.5 metres in width. The building façade is simple and without decorations. The lateral parts show prominent load-bearing construction elements. It is divided in two parts: the first, northern, entrance part houses ticket offices and two waiting rooms, one on the ground floor and other upstairs, and a basement, and the other, southern part contains an auditorium and a stage. The lavish ground floor entrance hall ‘for first and second seats’ used to include a bar and wicker chairs, and in the middle of the waiting room there was a fountain designed by sculptor Sunko, made of artificial stone. Decorative sculptures are also the work of sculptors Sunko and Pitzger. The entrance hall features a double stairwell decorated with sculptures by sculptor Vihra, a Prague academy alumnus, to the waiting room for the stalls and the balcony. The auditorium is 40 metres long, 14 metres wide and 11.5 metres high. The projection slate on the stage has a wide golden frame decorated with acanthus leaves ornament by sculptor Pitzger, and on the left and right hand side there are red marble pillars with lavishly adorned Composite capital heads with two fauns by Vihra bearing the load of the rest of the structure above the stage. Below the stage there was a setting for a 16-member orchestra. The walls are decorated with lavish stucco ornaments, and behind the representative wall candlesticks there are air shaft grills, as well as on the ceiling decorated with three wreaths. The building has central heating and air conditioning installed through shafts in the walls and ceiling leading from the engine room in the basement and special temperature regulation for each room. There were 1100 seats in the theatre (stalls, mezzanine, first and second seat) and all the seats were numbered. The local papers said that this hall was unique in the Balkans, whose auditorium was acoustically adapted to philharmonic and other concerts and other cultural lectures. 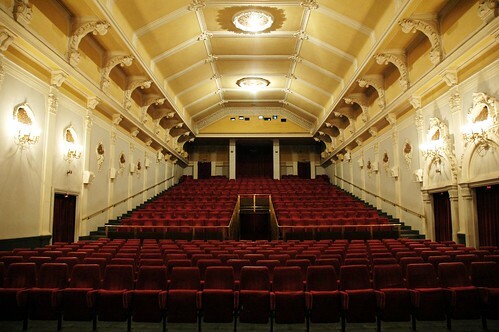 The theatre’s interior was preserved in its original state, except that the existing seats were replaced by new ones. Today there are 500 seats in the auditorium and a 15 x2 metre stage with a film screen. In the early 1950s, when the Poljoopskrba-Astra office building was built, designed by architect Božidar Tušek, in Varšavska 3-5, a partial reconstruction and additions to the building entrance were done, which defined today’s entrance vestibule to the building. The cinema was called Balkan-Palace and Balkan, and in the early 1990s it was renamed to Europa.